Throughout Japan’s ambitions to redefine superpower as cultural issue, the popular all-female musical theater Takarazuka Revue has been a faithful companion. Concurrently anachronistic in its gender exhibition and progressive in its performance practice, Takarazuka Revue has been typically reconstructing, since 1913, asymmetric interactions between identity and alterity, model and copy, as well as male and female – all wrapped up in spectacular tunes, magnificent costumes and luxurious scenery. While focusing on the postwar period, that is since the re-opening of the Grand Theater in Takarazuka in 1946, and on the tension between the androgynously charismatic otokoyaku figures [i.e., female interpreters of male roles in the Takarazuka Revue] and the apparently conformist and submissive musumeyaku figures [i.e., female interpreters of female roles in the Takarazuka Revue], it is this paper’s goal to underline some of Takarazuka Revue’s strategies to construct, develop, propagate and eventually implement its – and by extension: the Japanese – historical worldview by means of a new form of cultural imperialism, namely love as ideological base and an aesthetic superstructure of latemodern identity. This article quests to reveal the core element within the project of identity (re-)solidification proposed by the Takarazuka Revue: an emerging form of cultural awareness based on tenderness as existential attitude. Keywords: Takarazuka Revue; otokoyaku; musumeyaku; Kobayashi Ichizō; Zygmunt Bauman; identity paradigms; tenderness. Between 1997 and 2007 the foreign population of Japan increased by more than 45% making it the largest at any time in the postwar period, constituting 1.69% of the overall population. At the same time, the trans-border flows of people, capital and media increased at an unprecedented rate. In the Japanese media, there has been a marked increase in the number of television programs featuring non-Japanese. This paper focuses on the phenomenon of non-Japanese residents of Japan on variety television programs and shows that the increase of foreign faces on Japanese television is significant as non-Japanese residents are used here to reinforce ideas of Japanese cultural identity. These programs, while usually advertised as opportunities to look at issues from an international perspective, instead highlight perceived differences which exist between Japan and the outside world as a form of entertainment, rather than to seriously examine the issues Japan faces as it becomes more international. Employing a discourse analysis of recent programs as well as interviews with program participants, this paper examines media mechanisms which create an image of the foreign “other” that is employed to create, perpetuate and strengthen the idea of a unique Japanese cultural identity. Keywords: non-Japanese residents; cultural nationalism; variety television programs; Nihonjinron; discourses of Japanese uniqueness. Since the 1980s, eating disorders and self-harm among Japanese women have been on the rise. This socio-cultural study suggests that these behaviours are based in Japanese culture and have today become a female lifestyle. Motivated by cultural and historical constructions of femininity and the fear of social disintegration, this female lifestyle expresses a paradox: an attempt by women to over-perform and at the same time escape the obligation to navigate normative femininity. In parallel, eating disorders and self-harm are explicitly thematized in Japanese cultural expressions, from literature and manga to films and popular music. Using accounts from women engaged in this lifestyle, in addition to various fictional representations, this study conceptualizes a set of socio-psychological markers that exposes how eating disorders and self-harm are potentially represented in cultural expressions where such behaviours are not explicitly thematized. Miyazaki Hayao’s animation Sen to Chihiro no kamikakushi from 2001 serves as an example of how eating disorders, as a female lifestyle, have become a normative form of entertainment. Keywords: eating disorders; self-harm; contradictive femininity; Japanese cultural expressions; fiction; representation; Miyazaki Hayao. Spiritual safety nets and networked faith: The “liquidity” of family and work under late modernity. In the midst of the 20 years of economic and social uncertainty that has been punctuated by the worldwide financial crisis, an increasing rhetoric of economic uncertainty and social instability has risen to popular consciousness among many ordinary citizens in Japan. With changing economic and familial relations, individuals in Japan are participating in the networked communities of “moralizing institutions” to find renewed stability and a sense of empowerment in their lives. 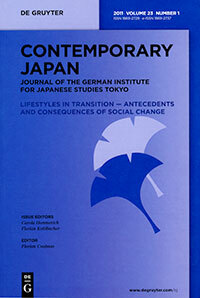 Through ethnographic fieldwork with an international religious organization and a domestic ethics organization, this paper analyzes the diverse ways in which individuals are reestablishing a sense of stability and direction by reengaging with idealized life patterns and family orientations that have become more elusive under the increasingly uncertain socioeconomic conditions. Specifically, I analyze how individual members were directly affected by what Zygmunt Bauman calls the “liquidity” of recent economic reforms including rising unemployment and late-career layoffs which had drastic repercussions on life planning and family relations. As human networks built from resilient networked faith, these moralizing institutions provide a different kind of logic of “liquidity” and “flexibility,” allowing members to realize their idealized life plans and to navigate toward the solid ground of a stable work and family life. Keywords: faith; family; work; liquid modernity. Modernization theories contrast traditional and advanced societies. In the former, religion and group identification – the identification with the ethnicity or the nation in particular – are means of integration and sources of happiness. Technological and economic developments undermine this base of mechanical solidarity and bring out individualism, self-expression and autonomy as new values. Happiness is now reached, if the autonomous citizen can successfully realize her/his goals. As theories of individualism and collectivism typically regard independence and autonomy as values of the individualistic cultural frame, it should be lower in those societies where collectivism is still prevalent. This would explain why happiness is relatively low in Japan. The first sections of the paper show that the key variable of these theories – i.e., the sense of autonomy – is not only logically distinct from independence and individualism but also empirically uncorrelated with indicators of the latter concepts. Furthermore, autonomy increases at best weakly with modernization. Though it does not meet the assumptions of modernization theories, autonomy is nevertheless a strong predictor of life satisfaction. The positive influence of religion and national identification, by contrast, is relatively weak. The low sense of autonomy can explain the level of life satisfaction in Japan fairly well. Keywords: World Values Survey; Modernization Theory; Autonomy; Religiosity; National Identification; Life Satisfaction; Happiness.